Obesity is defined as the accumulation of excessive body fat. When a child eats too much high calorie foods but doesn’t engage in sufficient physical activity to burn off the calories, it takes the form of fat and starts to accumulate all around the body. There are numerous Childhood obesity health risks. Obese children are more vulnerable to sickness, physical and psychological limitations, and absence in school. Here we have tried to gather all the available problems that a child would face if he/she is suffering from obesity. Type 2 diabetes: This type of diabetes is more common in adults but recently it’s been found that half of all obese children develops Type 2 diabetes in themselves. A survey shows that overweight adolescents are 2.6 times more vulnerable to Type 2 diabetes than adolescents with normal weight. Asthma: Obese or overweight children have almost 50% increased risk of having asthmatic problems. A data analysis by National Survey of Children’s health showed that 19.7% of children of 10-17 years of age having asthma, have a chronic condition. Sleep apnea: One of the most serious health risks related to obesity is sleep apnea. Study shows that obese children and adolescents are 60% more likely to suffer prom this health condition. Cardiovascular diseases: Obese and overweight children and adolescents have high blood pressure and high cholesterol level in their blood. These make them more prone to cardiovascular diseases. Research shows that 70% of obese children have at least one cardiovascular risk factor and 39% of them have two or more. Other health crises: Apart from these diseases and problems, obese children are also vulnerable to the risk of fatty liver disease, gallstones, gastro-esophageal reflux, joint problems, musculoskeletal discomfort, impaired glucose tolerance, and insulin resistance. Obesity doesn’t only leave its footprint on one’s health. It has a shattering effect on a child’s psychological and social condition as well. 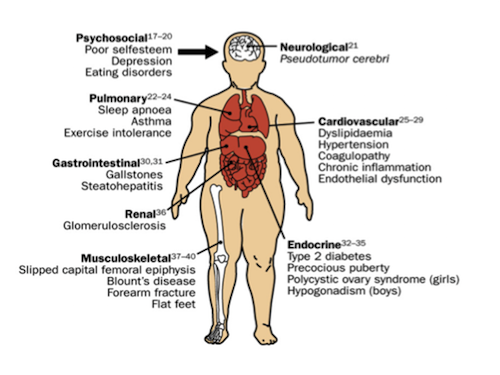 Low self-esteem and stigma are very common in obese children. Social insecurity is also very common. For these, there is a long term negative effect on the mental health of obese and overweight children. Children with obesity are at greater risk of becoming obese adults in future.